Sir Walter Scott was a novelist, poet, and critic. He was born in Edinburgh, Scotland in 1771 and is probably most renowned for his historical novels full of chivalry and romance. 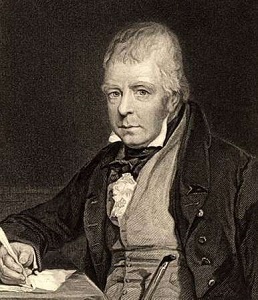 Scott published his first novel, Waverley, in 1814. It’s often regarded to be the first historical novel and he published it anonymously. The book proved to be so popular, the advertising for Scott’s later novels stated they were written by “the author of Waverley”. The Tapestried Chamber was originally published in The Keepsake For 1829 (English literary annual). It’s a story about a military man who spends a night in a friend’s chateau and sleeps in a haunted room. General Browne is a brave man who is used to roughing it in the bush, but his experience in the tapestried chamber at the chateau are enough to try even his nerves of steel. One night is all he can take and he leaves the next morning. About the end of the American war, when the officers of Lord Cornwallis’s army, which surrendered at York-town, and others, who had been made prisoners during the impolitic and ill-fated controversy, were returning to their own country, to relate their adventures, and repose themselves after their fatigues; there was amongst them a general officer, to whom Miss S. gave the name of Browne, but merely, as I understood, to save the inconvenience of introducing a nameless agent in the narrative. He was an officer of merit, as well as a gentleman of high consideration for family and attainments. Some business had carried General Browne upon a tour through the western counties, when, in the conclusion of a morning stage, he found himself in the vicinity of a small country town, which presented a scene of uncommon beauty, and of a character peculiarly English. The little town, with its stately church, whose tower bore testimony to the devotion of ages long past, lay amidst pasture and corn-fields of small extent, but bounded and divided with hedge-row timber of great age and size. There were few marks of modern improvement. The environs of the place intimated neither the solitude of decay, nor the bustle of novelty; the houses were old, but in good repair; and the beautiful little river murmured freely on its way to the left of the town, neither restrained by a dam, nor bordered by a towing-path. Upon a gentle eminence, nearly a mile to the southward of the town, were seen, amongst many venerable oaks and tangled thickets, the turrets of a castle, as old as the wars of York and Lancaster, but which seemed to have received important alterations during the age of Elizabeth and her successors. It had not been a place of great size; but whatever accommodation it formerly afforded, was, it must be supposed, still to be obtained within its walls; at least, such was the inference which General Browne drew from observing the smoke arise merrily from several of the ancient wreathed and carved chimney-stalks. The wall of the park ran alongside of the highway for two or three hundred yards; and through the different points by which the eye found glimpses into the woodland scenery, it seemed to be well stocked. Other points of view opened in succession; now a full one, of the front of the old castle, and now a side glimpse at its particular towers; the former rich in all the bizarrerie of the Elizabethan school, while the simple arid solid strength of other parts of the building seemed to show that they had been raised more for defence than ostentation. Delighted with the partial glimpses which he obtained of the castle through the woods and glades by which this ancient feudal fortress was surrounded, our military traveller was determined to inquire whether it might not deserve a nearer view, and whether it contained family pictures or other objects of curiosity worthy of a stranger’s visit; when, leaving the vicinity of the park, he rolled through a clean and well-paved street, and stopped at the door of a well-frequented inn. Before ordering horses to proceed on his journey, General Browne made inquiries concerning the proprietor of the chateau which had so attracted his admiration, and was equally surprised and pleased at hearing in reply a nobleman named whom we shall call Lord Woodville. How fortunate! Much of Browne’s early recollections, both at school and at college, had been connected with young Woodville, whom, by a few questions, he now ascertained to be the same with the owner of this fair domain. He had been raised to the peerage by the decease of his father a few months before, and, as the General learned from the landlord, the term of mourning being ended, was now taking possession of his paternal estate, in the jovial season of merry autumn, accompanied by a select party of friends to enjoy the sports of a country famous for game. This was delightful news to our traveller. Frank Woodville had been Richard Browne’s fag at Eton, and his chosen intimate at Christ Church; their pleasures and their tasks had been the same; and the honest soldier’s heart warmed to find his early friend in possession of so delightful a residence, and of an estate, as the landlord assured him with a nod and a wink, fully adequate to maintain and add to his dignity. Nothing was more natural than that the traveller should suspend a journey, which there was nothing to render hurried, to pay a visit to an old friend under such agreeable circumstances. The fresh horses, therefore, had only the brief task of conveying the General’s travelling carriage to Woodville Castle. A porter admitted them at a modern Gothic Lodge, built in that style to correspond with the Castle itself, and at the same time rang a bell to give warning of the approach of visitors. Apparently the sound of the bell had suspended the separation of the company, bent on the various amusements of the morning; for, on entering the court of the chateau, several young men were lounging about in their sporting dresses, looking at, and criticising, the dogs which the keepers held in readiness to attend their pastime. As General Browne alighted, the young lord came to the gate of the hall, and for an instant gazed, as at a stranger, upon the countenance of his friend, on which war, with its fatigues and its wounds, had made a great alteration. But the uncertainty lasted no longer than till the visitor had spoken, and the hearty greeting which followed was such as can only be exchanged betwixt those who have passed together the merry days of careless boyhood or early youth. The General made a suitable reply, and congratulated his friend on his new dignities, and the possession of a place and domain so beautiful. The General gladly accepted his friendly host’s proposal in all its points. After a morning of manly exercise, the company met at dinner, where it was the delight of Lord Woodville to conduce to the display of the high properties of his recovered friend, so as to recommend him to his guests, most of whom were persons of distinction. He led General Browne to speak of the scenes he had witnessed; and as every word marked alike the brave officer and the sensible man, who retained possession of his cool judgment under the most imminent dangers, the company looked upon the soldier with general respect, as no one who had proved himself possessed of an uncommon portion of personal courage- that attribute, of all others, of which every body desires to be thought possessed. The day at Woodville Castle ended as usual in such mansions. The hospitality stopped within the limits of good order; music, in which the young lord was a proficient, succeeded to the circulation of the bottle: cards and billiards, for those who preferred such amusements, were in readiness: but the exercise of the morning required early hours, and not long after eleven o’clock the guests began to retire to their several apartments. The young lord himself conducted his friend, General Browne, to the chamber destined for him, which answered the description he had given of it, being comfortable, but old-fashioned. The bed was of the massive form used in the end of the seventeenth century, and the curtains of faded silk, heavily trimmed with tarnished gold. But then the sheets, pillows, and blankets looked delightful to the campaigner, when he thought of his mansion, the cask. There was an air of gloom in the tapestry hangings, which, with their worn-out graces, curtained the walls of the little chamber, and gently undulated as the autumnal breeze found its way through the ancient lattice-window, which pattered and whistled as the air gained entrance. The toilet too, with its mirror, turbaned, after the manner of the beginning of the century, with a coiffure of murrey-coloured silk, and its hundred strange-shaped boxes, providing for arrangements which had been obsolete for more than fifty years, had an antique, and in so far a melancholy, aspect. But nothing could blaze more brightly and cheerfully than the two large wax candles; or if aught could rival them, it was the flaming bickering fagots in the chimney, that sent at once their gleam and their warmth through the snug apartment; which, notwithstanding the general antiquity of its appearance, was not wanting in the least convenience that modern habits rendered either necessary or desirable. “I trust-I have no doubt-that you will find yourself as comfortable as I wish you, my dear General,” said the young nobleman; and once more bidding his guest good-night, he shook him by the hand, and withdrew. The General again looked round him, and internally congratulating himself on his return to peaceful life, the comforts of which were endeared by the recollection of the hardships and dangers he had lately sustained, undressed himself, and prepared himself for a luxurious night’s rest. Here, contrary to the custom of this species of tale, we leave the General in possession of his apartment until the next morning. The company assembled for breakfast at an early hour, but without the appearance of General Browne, who seemed the guest that Lord Woodville was desirous of honouring above all whom his hospitality had assembled around him. He more than once expressed surprise at the General’s absence, and at length sent a servant to make inquiry after him. The man brought back information that General Browne had been walking abroad since an early hour of the morning, in defiance of the weather, which was misty and ungenial. Yet the explanation which Lord Woodville thus offered to the company seemed hardly satisfactory to his own mind, and it was in a fit of silence and abstraction that he awaited the return of the General. It took place near an hour after the breakfast bell had rung. He looked fatigued and feverish. His hair, the powdering and arrangement of which was at this time one of the most important occupations of a man’s whole day, and marked his fashion as much as, in the present time, the tying of a cravat, or the want of one, was dishevelled, uncurled, void of powder, and dank with dew. His clothes were huddled on with a careless negligence, remarkable in a military man, whose real or supposed duties are usually held to include some attention to the toilet; and his looks were haggard and ghastly in a peculiar degree. “Oh, excellently well! remarkably well! never better in my life”-said General Browne rapidly, and yet with an air of embarrassment which was obvious to his friend. He then hastily swallowed a cup of tea, and neglecting or refusing whatever else was offered, seemed to fall into a fit of abstraction. General Browne, without giving any farther explanation, muttered something of indispensable business, and insisted on the absolute necessity of his departure in a manner which silenced all opposition on the part of his host, who saw that his resolution was taken, and forbore farther importunity. He paused a second time, and then perceiving that Lord Woodville remained silent and in an attitude of attention, he commenced, though not without obvious reluctance, the history of his night’s adventures in the Tapestried Chamber. “I undressed and went to bed, so soon as your lordship left me yesterday evening; but the wood in the chimney, which nearly fronted my bed, blazed brightly and cheerfully, and, aided by a hundred exciting recollections of my childhood and youth, which had been recalled by the unexpected pleasure of meeting your lordship, prevented me from falling immediately asleep. I ought, however, to say, that these reflections were all of a pleasant and agreeable kind, grounded on a sense of having for a time exchanged the labour, fatigues, and dangers of my profession, for the enjoyments of a peaceful life, and the reunion of those friendly and affectionate ties, which I had torn asunder at the rude summons of war. “While such pleasing reflections were stealing over my mind, and gradually lulling me to slumber, I was suddenly aroused by a sound like that of the rustling of a silken gown, and the tapping of a pair of high-heeled shoes, as if a woman were walking in the apartment. Ere I could draw the curtain to see what the matter was, the figure of a little woman passed between the bed and the fire. The back of this form was turned to me, and I could observe, from the shoulders and neck, it was that of an old woman, whose dress was an old-fashioned gown, which, I think, ladies call a sacque; that is, a sort of robe, completely loose in the body, but gathered into broad plaits upon the neck and shoulders, which fall down to the ground, and terminate in a species of train. Here General Browne stopped, and wiped from his brow the cold perspiration with which the recollection of his horrible vision had covered it. “My lord,” he said, “I am no coward. I have been in all the mortal dangers incidental to my profession, and I may truly boast, that no man ever knew Richard Browne dishonour the sword he wears; but in these horrible circumstances, under the eyes, and as it seemed, almost in the grasp of an incarnation of an evil spirit, all firmness forsook me, all manhood melted from me like wax in the furnace, and I felt my hair individually bristle. The current of my life-blood ceased to flow, and I sank back in a swoon, as very a victim to panic terror as ever was a village girl, or a child of ten years old. How long I lay in this condition I cannot pretend to guess. “But I was roused by the castle clock striking one, so loud that it seemed as if it were in the very room. It was some time before I dared open my eyes, lest they should again encounter the horrible spectacle. When, however, I summoned courage to look up, she was no longer visible. My first idea was to pull my bell, wake the servants, and remove to a garret or a hay-loft, to be ensured against a second visitation. Nay, I will confess the truth, that my resolution was altered, not by the shame of exposing myself, but by the fear that, as the bell-cord hung by the chimney, I might, in making my way to it, be again crossed by the fiendish hag, who, I figured to myself, might be still lurking about some corner of the apartment. “I will not pretend to describe what hot and cold fever-fits tormented me for the rest of the night, through broken sleep, weary vigils, and that dubious state which forms the neutral ground between them. A hundred terrible objects appeared to haunt me; but there was the great difference betwixt the vision which I have described, and those which followed, that I knew the last to be deceptions of my own fancy and over-excited nerves. Strange as the General’s tale was, he spoke with such a deep air of conviction, that it cut short all the usual commentaries which are made on such stories. Lord Woodville never once asked him if he was sure he did not dream of the apparition, or suggested any of the possibilities by which it is fashionable to explain supernatural appearances, as wild vagaries of the fancy, or deceptions of the optic nerves. On the contrary, he seemed deeply impressed with the truth and reality of what he had heard; and, after a considerable pause, regretted, with much appearance of sincerity, that his early friend should in his house have suffered so severely. General Browne accepted the invitation, though somewhat unwillingly. It was evident he was not to breathe freely or at ease till he left Woodville Castle far behind him. He could not refuse his friend’s invitation, however; and the less so, that he was a little ashamed of the peevishness which he had displayed towards his well-meaning entertainer. The General, therefore, followed Lord Woodville through several rooms, into a long gallery hung with pictures, which the latter pointed out to his guest, telling the names, and giving some account of the personages whose portraits presented themselves in progression. General Browne was but little interested in the details which these accounts conveyed to him. They were, indeed, of the kind which are usually found in an old family gallery. Here was a cavalier who had ruined the estate in the royal cause; there a fine lady who had reinstated it by contracting a match with a wealthy Roundhead. There hung a gallant who had been in danger for corresponding with the exiled Court at St. Germain’s; here one who had taken arms for William at the Revolution; and there a third that had thrown his weight alternately into the scale of whig and tory. While Lord Woodville was cramming these words into his guest’s ear, “against the stomach of his sense,” they gained the middle of the gallery, when he beheld General Browne suddenly start, and assume an attitude of the utmost surprise, not unmixed with fear, as his eyes were caught and suddenly riveted by a portrait of an old lady in a sacque, the fashionable dress of the end of the seventeenth century. Thus the friends, who had met with such glee, parted in a very different mood; Lord Woodville to command the Tapestried Chamber to be unmantled, and the door built up; and General Browne to seek in some less beautiful country, and with some less dignified friend, forgetfulness of the painful night which he had passed in Woodville Castle.